The quest to locate the Holy Grail has begun! Join Arthur and Merlin on their 5 reel, 243 payline uk slots adventure into the abyss to locate the greatest treasures of medieval history. Enjoy the high-resolution visual aesthetics in Quest for the Grail, a mystical online slot that enables you to be part of the greatest journey of all. Developer Eyecon has been running as a successful computer game company for over 20 years. Two years after it was founded their online casino took off and their first slot game was introduced in 2003. They are one of industry’s leading online slot game developers for bingo and casino based websites and one of the favourites here at casino slot games site. Eyecon has produced over 60 high quality popular and timeless games available to players across many online gaming platforms. Each game is created to provide every player with a game they can enjoy for a long time and each year more players and playing unique games with Eyecon. We love the slots online uk and think you will too. Quest for the Grail is a 5-reel 25 payline slot game with a medieval theme that will take you on your travels in a bid to search for the Holy Grail. The game comes with multipliers and free plays function. The background of the game is stereotypical to it’s theme as it features a big castle in the in the background with Stonehenge featuring in the top corner. The game can be played fro 30p to £7.50 per spin. The game is action-packed with plenty on offer especially chances to win big. Although the graphics aren’t superb its fitting to the game as it makes you feel like you’re back in mediaeval times and puts you in the heart of the game. The reels are set against a purple background with glowing pillars around them each with a set of pearls and jewellery on them. The symbols on the game include Knights, Dragons, Wizards, Shields, Flags, Princesses and plenty other medieval based symbols. The best symbol in the game is the sword of Excalibur which is the wild symbol in the game and will substitute all other symbols in the game. If the sword appears on the winning reels the overall prize will be doubled meaning you get a nice payout. If you find 3 scatter symbols it will trigger the bonus feature round, the scatter icons will tumble down the reels at the same time. You could win up to 25 free spins or a chance to choose from the Grail of Choice. If you decide to choose the Grail of Choice option, you could earn a multiplier of 100x. The game also comes with other multipliers including x1 for a wooden grail, x2 for the glass grail, x3 for the bronze grail, x4 for the silver grail and x5 for the gold grail. These multipliers will increase your potential winnings and the amount of free plays you can get. The theme of the game is different and interesting to other slot games which draw players in and keeps them playing for longer. Don’t consider the quality of the graphics a drawback it actually fits the theme really well and probably better than modern graphics as it wouldn’t work with the game as well. There is plenty on offer to keep you entertained so be sure to give it a try and you might be in luck and win big. RTP 96-97%. 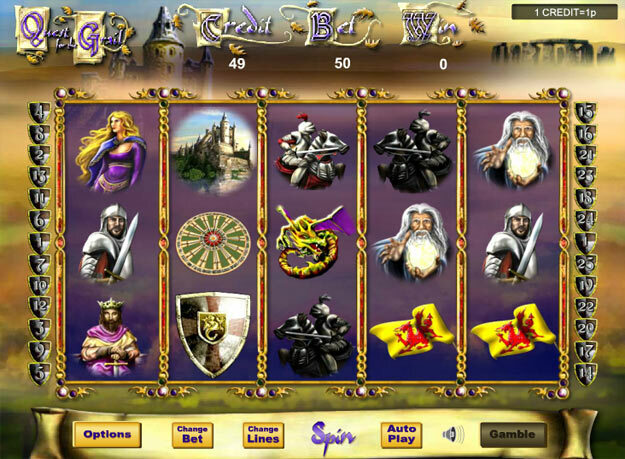 If you enjoyed Quest for the Grail you might also like Lucky Irish slot, click now! Join and play today! Visit https://www.easyslots.com to get started.